Hi All, wish you a very happy new year. It’s been a long time since my last post and this is the first one of 2013. 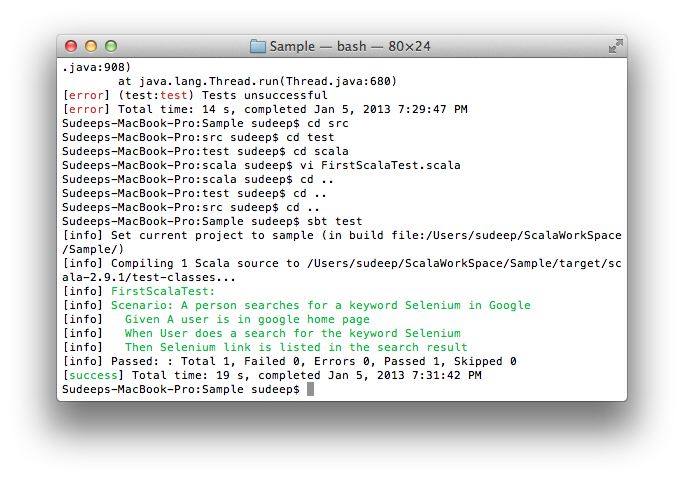 I had been doing some interesting stuff over past few weeks on Behaviour Driven Automation testing and will share with a simple example on how to do the same with selenium. The catch here is with the Java library. First let me explain what behavioural testing is. It is something like you write a story for a feature and based on the story you do your testing. You construct your stories on how the system would behave. Let’s consider http://www.google.com. If we had to write a story for it’s search functionality, the story in most of the cases would be as below. Now let’s break it down to a behavioural specification. For the example taken, the specification may look as below. When you run this class using sbt, your test result is published as a story. For example for the test given above the output would be as below. Thanks for the interesting post. I really like scenario DSL, very clean. Reminds me RSpec and capybara.